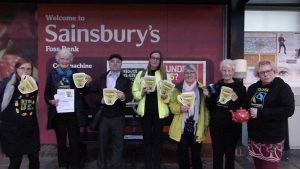 In October, Fairtrade campaigners took a stand against the mean decision of supermarket giant ‘Sainsbury’s’ to abandon the Fairtrade certificate for tea in favour of launching their own ‘fairly traded’ scheme. The new scheme will have a different approach to the distribution of the Fairtrade premium. Whereas Fairtrade guarantees a premium which is paid to producer groups for them to decide how it will be spent to the benefit of their communities, Sainsbury’s will require that their producers will have to apply to a central committee to receive a premium. The committee will vet the application, deciding what is in the best interests of the producers. We at Fairtrade Yorkshire believe that the producers are the best people to decide what their earnings should be spent on. York Fair Trade Forum members protest at Sainsbury’s York Foss Bank store. On October 28th there was a national day of action in protest at Sainsbury’s decision. Online, campaigners targeted 85% of stores. Offline, people did a huge amount – from craftivism to improvised drama in the checkout queue.